The organizations, merchants, manufacturers and suppliers listed below are not associated with the CDSOA, Inc. The CDSOA Inc. neither endorses nor recommends any of the manufacturers or suppliers listed below. They are listed here for informational purposes and your convenience. Purchases are made at your own risk and any questions or problems concerning any of the merchants, manufacturers, suppliers or their products should be directed to the individual merchant, manufacturer or supplier. CCDOA Items -- Visit the CCDOA\'s Quartermaster\'s Shack for burgees, hats and license plate frames. 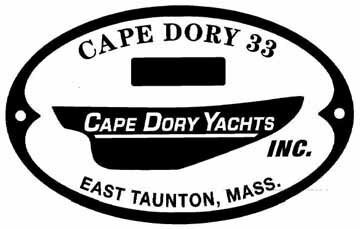 Half-Hull Models -- Trident Studio has some historical relationsip to the original supplier of the CD half hulls. You may also have some luck with SD Model Makers or Spotwood Studio/Nautic-Art. Line Drawings: We have the line drawings for only two Cape Dory sailboat models, the CD27 and CD28. 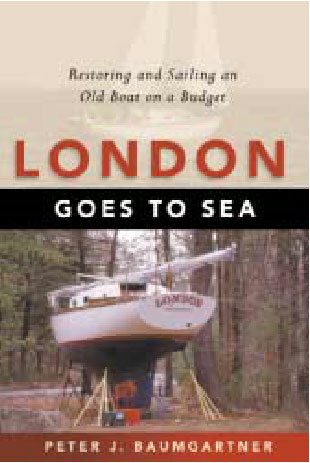 London Goes to Sea: Restoring and Sailing an Old Boat on a Budget -- By Peter Baumgartner. “Although I had sailed for years, I had never owned a sailboat before and certainly never attempted to restore one…." The story of the restoration of an old Cape Dory 27. Order your copy today from Amazon.com or Barnes & Noble. Port Rain Shields -- Mike Cyr, in conjunction with Cape Dory owner Paul Kamins, have created a plastic rain shield to fit the standard bronze 13 1/2" Spartan portlights on your Cape Dory. These rain shields allow for greater ventilation and permit leaving the ports open during periods of rain. If interested, or to order, please contact Mike Cyr at mcyr@maine.rr.com or by calling 207-229-0195. The Port Rain Shields are $65 each. For multiple rain shields: 2 @ $62.50 each, 4 @ $60 each, 5+ @ $55 each. PortVisor -- Seaworthy Goods manufacturers a plastic rain shield to fit the standard bronze 13 1/2" Spartan P560 portlights found on most of our Cape Dorys. These port shields are made from clear UV-resistant Lexan with a slight bronze tint. They allow you to keep the ports open rain or shine, air out the cabin and head, and maintain visibility while increasing your boat\'s comfort. If interested, order online or contact Paula Biles at BoatStuff@SeaworthyGoods.com or by calling 941-448-9173. PortVisors (Model# 17-RE) are $37 each. Bronze Port Screens -- For 2012, Cape Dory owner and CDSOA member John Danicic continues to create bronze screens that fit the bronze 13 1/2" Spartan portlights on your Cape Dory. Installed from the inside, these screens allow for greater ventilation and permit leaving the ports open while keeping the insects out. If interested, or to order, please visit The Screens of Schooner Bay web site or contact John Danicic at john@johndanicic.com or by calling 612-308-2994. The Cape Dory Standard portlight screens are $30.00 each plus $11.00 shipping per order. Also available are screens for the smaller standard portlight, 14 1/4 x 4 1/4 inches, found on CD300 Motorsailers, Spartan Part number P579. More info at CD300 Screens. He also makes both rectangular and oval screens available for Pacific SeaCraft and later Westsail portlights as well as crafting Custom Screens for other boats. 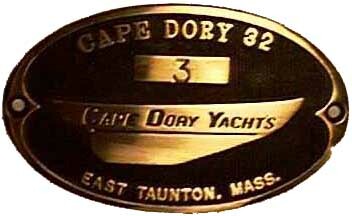 Cape Dory builder's plates -- Order a new bronze hull number builder\'s plate for your Cape Dory. The plates are available with or without the "browned" background. Bristol Bronze also offers a large selection of traditional bronze fittings.